Tenn., was announced recently by A1 Zang, president of NABRICO. NABRICO with the capabilities of produc- ing oceangoing vessels there. The expansion is designed to provide NABRICO with the added flexibility necessary to meet the ever- increasing market demands for hopper barges, tank barges and oceangoing vessels. City. Some 30,000 square feet will be added to the fabrication area, including a new hatch cover facility. A 50-ton bridge crane will be housed in this area. The assembly area will be increased by 20 percent, adding the capability to effectively translate and launch a 340-foot oceangoing vessel. City, pioneered the design and building of much of the modern equipment used on rivers today. September 23, 24, 25, 1980. Council of American Flag Ship Operators. Conference chairman Capt. Alfred E. Fiore of Mara-Time Marine Service, commented: "Tremendous strides have been made in the 'new technology' in the areas of navigation, communications, and weather adaptive proc- esses of ship operations. At the same time, there has been a large growth in the size of the world's merchant fleets along with an alarming increase in vessel casualties. The latter development has caused international reaction in the form of severe regulatory requirements. The vessel operators are pres- ently worried about effecting compliance with these new regulations. We feel that the solution of this problem, along with the concommitant interest in saving fuel and safeguarding the marine environment, im- plies an urgent need to spread the word on how this 'new technology' can assist vessel operators in attaining improved safety rec- ords and hence, stay within the spirit and constraints of the new laws. The Symposium on Ship Operations is dedicated to this precept." Floor, New York, N.Y. 10004. ADAC, Hatfield, Pa., recently published a four-page illustrated brochure complete with technical specifications on their new quarter- turn valve actuators. ADAC actuators' features: (a) self-locking gear trains permitting the use of drive mo- tors one-third the size required for conven- tional actuators, while providing the same amount of torque; (b) manual operation without declutching; (c) an overload release for both manual and electric operation; (d) conversion of actuator speed without major disassembly in the field; (e) reorien- tation in the field; (f) dual torque switches independently adjustable; (g) multiposition limit switches; (h) valve-mounted installa- tion eliminates need for intermediate gear box. For a free copy of the brochure on ADAC quarter-turn actuators write Charles F.
The Harris RF-230M, a major step forward in marine radio. 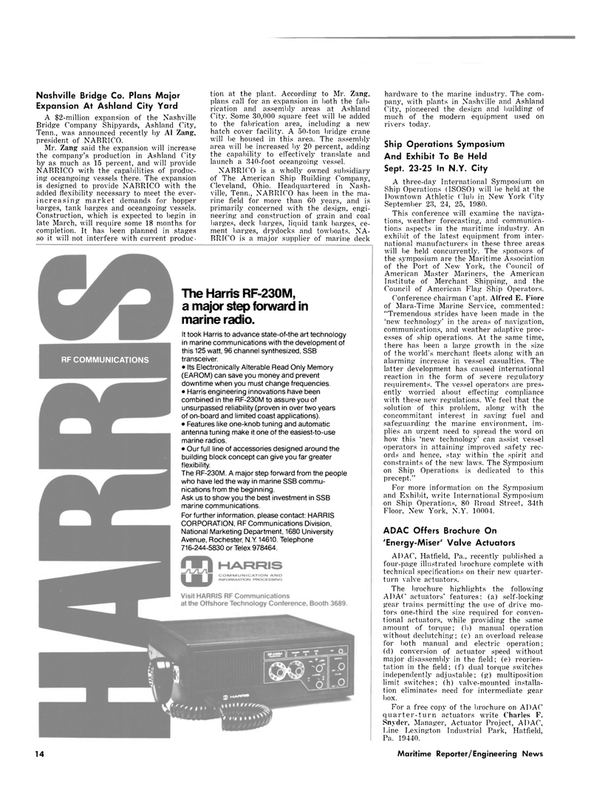 It took Harris to advance state-of-the art technology in marine communications with the development of this 125 watt, 96 channel synthesized, SSB transceiver. • Its Electronically Alterable Read Only Memory (EAROM) can save you money and prevent downtime when you must change frequencies. • Harris engineering innovations have been combined in the RF-230M to assure you of unsurpassed reliability (proven in over two years of on-board and limited coast applications). • Features like one-knob tuning and automatic antenna tuning make it one of the easiest-to-use marine radios. • Our full line of accessories designed around the building block concept can give you far greater flexibility. The RF-230M. A major step forward from the people who have led the way in marine SSB commu- nications from the beginning. Ask us to show you the best investment in SSB marine communications.